Here in the Pre-2018/19 New Year’s Eve/Day Binge-a-Thon, I have begun a tad early. Every year there are Christmas lists that have It’s A Wonderful Life on them, including the Top 10 Show’s Top 10 Christmas villains from last week) and I have honestly never been that interested in watching it. I mean, I have seen a few scenes here and there and I have a knowledge of Frank Capra’s story that has become a cultural zeitgeist in our society. I’ve seen parodies or homages to this movie over the years, everywhere from Moonlighting to Buffy the Vampire Slayer to Mork and Mindy. I just have never seen the actual movie. I am here to say that I now understand. 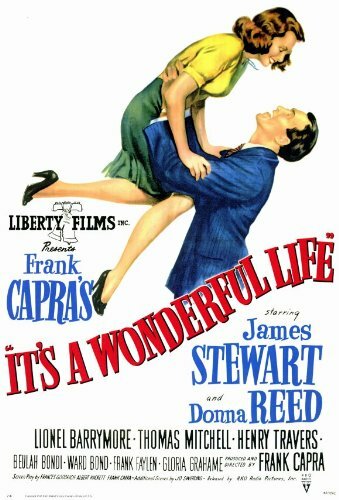 I am a convert to this wonderful movie, starring James Stewart as George Bailey, a good man who finds himself down on his luck and in a near suicidal state when the angel Clarence (Henry Travers) arrives to show him what life was like had George never been born. I had no idea how much of this movie was spent with the characters of George Bailey and the people of his life. The whole “George wishes he was never born” is fully in the third act and It’s A Wonderful Life spends most of the movie showing us who George Bailey is and how he came to be on that bridge considering throwing himself into the raging river. The fact that this movie takes its time to reach that moment really helps to build a connection with the character of George Bailey so that you are invested in the magic that comes in the third act. I have to say that I was tearing up with the very end of the film and I had a huge smile on my face as it was developing. Donna Reed does a fabulous job as George’s wife Mary, the woman who is completely dedicated to George despite many chances of finding more. Of course, the idea that George is really the richest man comes from what he has in his life, not because of the money and Mary is a perfect example of that. It really isn’t that much of a Christmas movie either. Honestly, only the end scenes happen at Christmas. Heck, Die Hard is more of a Christmas movie than this is. I am pleased that I finally took the time to watch this classic of cinema and to see just what everybody else was talking about. This is an iconic film of tremendous value and I enjoyed it totally.